The bronze sculpture of an upright otter with a large fish at its feet, and the plaster original, were photographed at the Marshall M. Fredericks Sculpture Museum on the campus of Saginaw Valley State University. The work was created as an auxiliary figure for Fredericks’ Leaping Gazelle fountain. The original fountain installation, “The Levi L. Barbour Memorial Fountain”, is on Belle Isle, in the Detroit River. Three other animals, a grouse, a hawk, and a rabbit, complete the set of animal figures at the base of the fountain. They supposedly represent animals that were native to this small island. A smaller version of the entire fountain is owned by the Frederik Meijer Gardens & Sculpture Park, but has been in storage for a couple of years during an extensive expansion of the main building complex at that venue. The Leaping Gazelle can be seen on its own, absent a fountain environment, at other sites, including Dow Gardens in Midland, Michigan. We both thought otter for the O challenge--yours are River Otter (in art form), while mine is Sea Otter in real life. Both great O's. 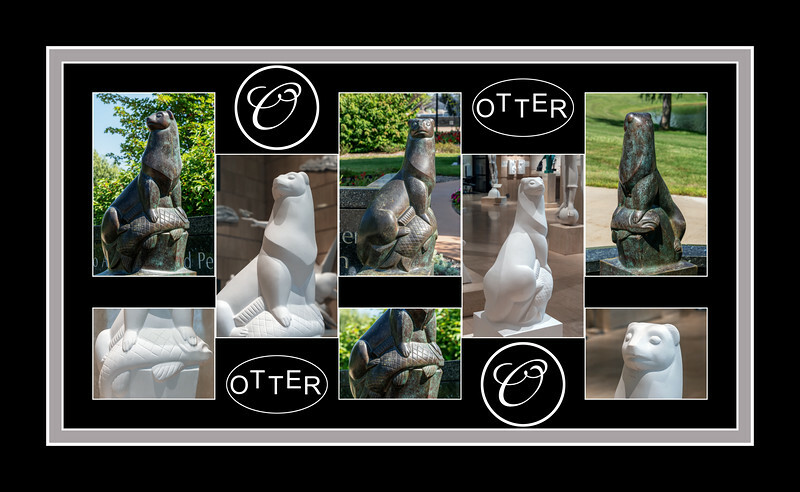 This is an awesome collage of Otter shots, so unique to see so many! I bet the fountain is lovely. Great O day captures! Awesome "O". Very nice sculptures. Nice set of sculptures of a lovely creature. Great O. Awesome way to illustrate "Otter"! Love the way you have constructed the collage! Another one of your great collages and perfect for 'O'!